BRBritish Rail or British Railways rating 5MTThe British Railways system of classifying steam locomotives by power using a number from 0, least powerful, to 9, most powerful, followed by either F for freight, P for Passenger or MT for Mixed Traffic. 7819 Hinton Manor is a GWRGreat Western Railway CollettCharles Benjamin Collett, Chief Mechanical Engineer (CME) of the Great Western Railway 1922-1941 7800 Manor class 4-6-0 mixed traffic locomotive. 7819 Hinton Manor is one of three GWRGreat Western Railway CollettCharles Benjamin Collett, Chief Mechanical Engineer (CME) of the Great Western Railway 1922-1941 7800 Manor class locomotives based at the SVRSevern Valley Railway, the others being 7802 Bradley Manor and 7812 Erlestoke Manor. The Manor Class 4-6-0 mixed traffic locomotive was designed as a lighter version of the GWRGreat Western Railway Grange Class, giving a wider Route Availability. The first 20, of which Hinton Manor was the last, were built between 1938 and 1939 and incorporated parts from old GWRGreat Western Railway 4300 Class Moguls. BRBritish Rail or British Railways built a further 10 in 1950 and rated the class 5MTThe British Railways system of classifying steam locomotives by power using a number from 0, least powerful, to 9, most powerful, followed by either F for freight, P for Passenger or MT for Mixed Traffic..
7819 was named after the manor house at Hinton Waldrist near Oxford. Built in 1939, 7819 began life at Carmarthen, moving to Oswestry in July 1943. Apart from periodic transfers to Whitchurch, this remained 7819’s principal home for the next 20 years. In March 1963, 7819 moved to Machynlleth. 7819 regularly headed the ‘Cambrian Coast Express’ from Shrewsbury and on 10 August 1963 double-headed the Royal Train with 7822 for HM The Queen's visit to Pwllheli. 7819 moved to Shrewsbury in January 1965, before being withdrawn by BRBritish Rail or British Railways at the end of the same year. 7819 arrived at the SVRSevern Valley Railway from Barry Scrapyard in 1973, having been bought through the Hinton Manor Fund, with SVRSevern Valley Railway Company help. In spring 1977 a raffle organised by the SVRA Wolverhampton Branch was held to raise funds to buy fittings and restore the tender. Restoration was completed in the late summer of 1977, and 7819 was a prolific performer in the years that followed both on the SVRSevern Valley Railway and the main line. The latter included the GW150 celebrations in 1985, when 7819 travelled to Plymouth, Swindon, Avonmouth and Newport, and also the 1987 Cambrian Cardigan Bay Express special service steam services between Machynlleth and Pwllheli where 7819 became the first steam locomotive in more than 20 years to haul a passenger service on this section of the Cambrian Coast Line. A full list of main line appearances is given below. In 1990 7819 conveyed HRH The Duke of Gloucester from Kidderminster to Bridgnorth for the official opening of the railway's boiler repair shop. The Duke drove 7819 for part of the journey. The locomotive also made the first operational entry into platform 2 at Kidderminster when it was brought into use on 25 November of that year. 7819 featured in an episode of the BBC drama series The Inspector Alleyn Mysteries broadcast in 1993. Following a loan to the Nene Valley Railway in 1994, 7819 was placed in storage awaiting major repairs on 7 January 1995. 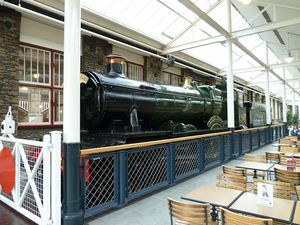 After a period in store in the open the locomotive was cosmetically restored and placed on static display in the McArthurGlen shopping complex, Swindon. 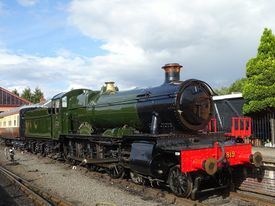 It returned to the SVRSevern Valley Railway on 21 August 2018 and moved to static display at The Engine House in March 2019. The 'footplate' is accessible to allow visitors to climb aboard and learn how to operate a steam locomotive, and for weddings and civil ceremonies. The locomotive was owned by the Hinton Manor Fund of which SVR Wolverhampton Branch was the major shareholder. It is now owned by The SVR Charitable Trust, having been formally transferred from the Hinton Manor Fund for a nominal sum in April 2004. The Branch was the sponsor of the 2010 Autumn SVRSevern Valley Railway raffle which was called “Fittings Fit for a Manor” to overhaul or replace worn out cab fittings as appropriate. This page was last modified on 7 April 2019, at 17:21.